Chemguard conducted another informative, well-attended Foam System Design and Application Training Seminar November 10-11, in Mansfield, Texas. The three-day program consisted of classroom lectures, hands-on activities, equipment demonstrations (see monitor demonstration in top photo), a live fire burn demonstration, and a tour of Chemguard’s manufacturing, production, and test facilities. 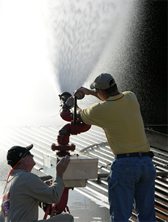 An important component of Chemguard’s comprehensive customer support, the seminar provided sprinkler contractors and fire suppression systems design engineers an opportunity to learn from field-experienced Chemguard systems design and sales engineers. 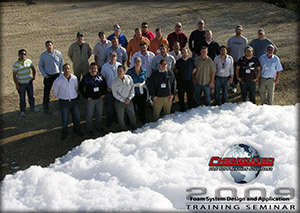 Chemguard’s next Foam System Design and Application Training Seminar has been tentatively scheduled for May 11-13, 2010. For additional information, contact Chemguard Marketing Manager Matt Boyle, 817 473-9964.